In assisting law enforcement agencies and courts, forensic pathologists play crucial roles in gathering and examining materials that are used to build criminal cases. Yet a recent study by Janujah Sivanandan and Eugene Liscio (University of Toronto) shows that the instruments and methods of forensic investigation can sometimes miss the mark; or worse, they may even neglect critical evidence. 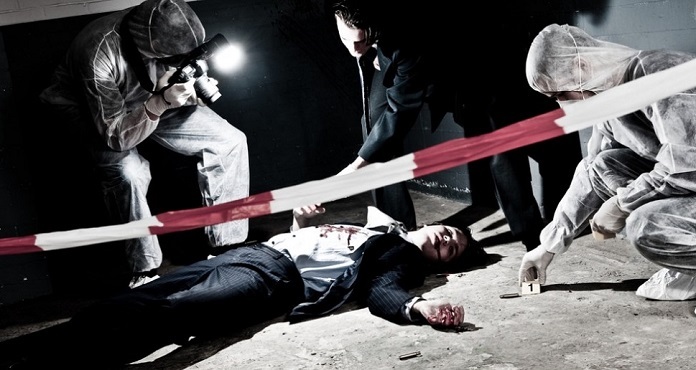 Traditionally, forensic pathologists have documented scenes of crime and autopsies with the aid of photography. And to this day, little has changed – cameras remain their go-to device. However, as the research underlines, the 2D images cameras generate – regardless of their resolution, technical specifications, and overall visual quality – lack crucial data that only spatial relations between objects can create. Indeed, these parameters can be of such critical value that they may determine whether the criminal justice system ends up prosecuting the innocent and vindicating the offender. The scientists from the University of Toronto point out that, while manual measurement is sufficient to gauge spatial dimension, the parameters acquired may well constitute rough estimates. According to the authors of the study, the necessity of geometric information to criminal investigation exposes a glaring gap in forensic methodology, explaining therefore the reliance of pathologists on rulers and tape measure as panacea to a problem that current 3D scanning technology can easily address. The scientists from the University of Toronto point out that, while manual measurement is sufficient to gauge spatial dimension, the parameters acquired may well constitute rough estimates. Clearly, rough estimates ought not to serve as the basis for jury deliberations, court rulings, and criminal sentencing. Nevertheless, that remains the reality of contemporary forensic science. The objective of the experiment therefore was to put conventional forensic methods to the test by comparing them to 3D imaging technology. For their experiment, the researchers chose Artec Eva structured light 3D scanner to determine how well it measured up against current photographic documentation tools. Artec Eva is a professional grade 3D imaging tool that has revolutionized countless industries from aviation to orthopedics. It is, moreover, a decorated veteran actor in countless studies, experiments, and tests across a large swathe of academic disciplines and technical fields. For this particular experiment, a live participant was given 11 temporary tattoos on various regions of their body – around the head and neck area, along the length of both arms and legs. This way the authors of the study could assess the performance of 3D scanners in obtaining, firstly, high quality color – an element in forensic pathology that can reveal much beyond the identity of the victim vis-à-vis body modifications. In fact, color can shed light on the varying condition of the body, providing investigators with a richer spectrum of forensic data. For example, the degree of coloring of traces of bodily trauma, including bruises and wounds, may convey the severity of the injury and its progression. More generally, skin discoloration can reflect the body’s stage of decomposition. Add environmental factors to the picture, like the setting of the body’s discovery and weather, and color can act as a timestamp which could be the key piece of the puzzle. Artec Eva being used to scan a live participant. The experiment consisted of two tests performed and observed under uniform conditions: one for photography and the other for Artec Eva. In the first test, the participant was asked to lie down. To register distances, a tape measure was used throughout with reference to orientation sites of the face and body (i.e., nose, elbows, knees, etc.). The body was then photographed along with scaling drawn out on the sides of the table. Meanwhile, additional photographs of the injuries were made at closer ranges. With Artec Eva, for the second test, the process was noticeably smoother. 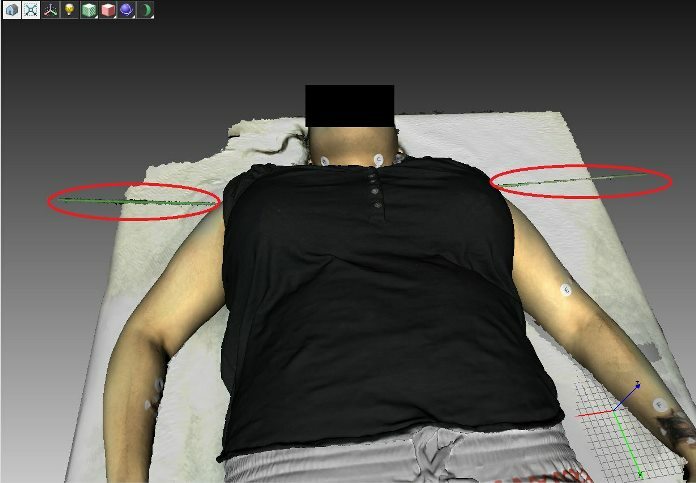 The body of the participant was scanned several times with the 3D imager. 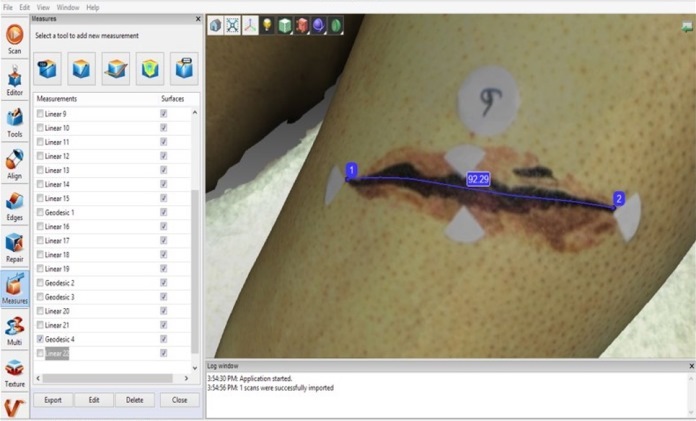 Artec Studio’s geodesic tool helped record measurements of injuries and curvatures. A color map was applied in order to register color. Meanwhile, during the scan, the output on the computer displayed 3D mesh data or point clouds, which help with adjusting viewing angles and orientations. Notably, they result in meshed surface data which allows for higher resolution. The platform for these scans was Artec Studio 3D scan software, where the images underwent alignment and fusion for the assembly of the 3D digital replica. An example of the geodesic tool being used to measure a tattoo on a curved surface of the body. Users of 3D data truly benefit from the flexibility and versatility with which the images can be manipulated and viewed. They allow for a greater range of use, thus providing a fuller and more realistic account, in this case, to forensic pathologists. For example, the ability to recreate the trajectory of a foreign object entering the body can assist law enforcement agencies and med experts in determining the cause of death, as well as the interaction of actors in a crime scene. In effect, it opens up other possibilities to discover new contexts of the crime. For the purposes of the experiment, the authors of the study attempted to recreate the trajectory of a bullet entering the body. They erected tripods at the sides of the examination table and placed steel rods to represent the bullet’s path. Due to their gloss, rods are often hard to capture, especially for structured light scanners, where the conflicting light sources generate a great deal of noise. Nevertheless, Artec Eva handled the task well. Such exercise would have been out of the question for photographic documentation, which fails to convey geometries. Screenshot of the bullet trajectory setup in Artec Studio. The green lines circled in red represent the trajectory rods that were successfully scanned with Artec Eva. Indeed, the capacity of Artec Eva to reproduce geometric details proved the most effective improvement when one compares it to conventional forensic methods. Its combined capacity to capture color is also noteworthy. Yet the authors of the study did not stop there. They also pursued a parallel inquiry, namely how easy these methods were and how error-free these devices were. After all, technology that is designed to supply complex and multi-layered data must necessarily be difficult to operate. The study debunks this assumption. While it took exactly 54 minutes and 30 seconds to complete full photographic documentation, Artec Eva beat out the conventional method by nearly half at a swift 26 minutes and 1 second. To quantify ease of photographing and 3D scanning, the experimenters devised a method for calculating efficiency and ease of use. The method constituted a scoring system based on technical difficulty (which could encompass such “hiccups” as software failure that may seriously impede documentation) and the time spent on documenting. The results were immediately evident. While it took exactly 54 minutes and 30 seconds to complete full photographic documentation, Artec Eva beat out the conventional method by nearly half at a swift 26 minutes and 1 second. A large part of the difference is owed to the speed of up to 16 frames per second with which Artec Eva can replicate complex geometries. Also, much of post-processing can be performed after the autopsy itself, cutting time dramatically. The researchers from the University of Toronto concluded that Artec Eva held substantial advantages over current forensic documentation methods. Not only did Artec Eva record color better than photo cameras, it could also render rich datasets in 3D without any of the technological complexity. Moreover, its generated 3D data can reveal and preserve findings more tangibly and efficiently. Of particular note is the apparent “freshness” that the data retains whether now or in posterity. With the new technology, revisiting so-called "cold cases" is less hindered by lost, corrupted, or decontextualized data. Forensic pathologists new to a case can simply open the image files, manipulate and examine them from various angles, and acquaint themselves with the visual evidence much more quickly than sifting through piles of pictures or swiping across a gallery of disconnected images. In other words, the difficulty of having to recreate the crime scene is virtually eliminated with Artec Eva. Artec scanners help to deliver personalized healthcare 3D solutions that are a perfect fit for the anatomy of each patient and that are suitable for low invasive treatment of pathologies such as congenital thoracic deformities, which are anomalies in the growth of the chest wall.